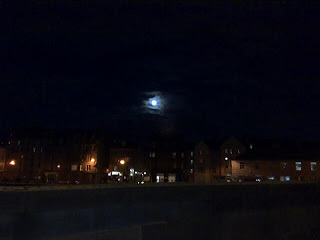 One of the many reasons I love Edinburgh is the moon. On the nights when it is actually not raining and we can see the moon, it always seems to be spectacular. Something about it always seems like it needs to be in a creepy movie. But, it seems like we are closer to this creepy moon than we were in California and it always seems so clear. Seriously, if I look hard enough, I actually see the ant people living on the moon! Now that winter is headed our way, we are seeing a lot more of the moon. Gone are those long summer (it is just a name, not an indication of warm weather) days when the sun was up at 3am, and not in bed until 10:30. I loved those days! The extra sun added a little bounce into my step! Getting up at 4:30 no longer seemed early, as the sun was already out. Now, the sun doesn't begin making it's appearance until 7:30, and at the worst of it, we won't be seeing it until 9 or 10! It's funny how sunlight becomes an indication of what I should be doing with my time. I am thinking of setting up a fake sun in my house to keep me being productive! Okay, so not really! Well my friend (the sun, that is), I will miss you when you are gone, but I know you will return with all your glory come spring! And as for your enemy (the moon), I will be seeing more of that creepy, perfect looking thing as winter moves on. When I went out to go potty last night I saw a full moon and thought about how you and me are looking at the same moon! I love your new picture and title...how'd you do that? ?